One day I’m going to start a think tank and name it after a bodywash – possibly a shampoo – just like Lincoln Child did with his fictional institution, Lux. There’s a problem in the west wing of the think tank Lux. No, it isn’t that their research is funded by special interest groups. No, it isn’t that they are neo-cons intent on bending governments to their policy wills. Lux has a slight problem with residents going crazy. So they contact Dr Jeremy Logan, a former resident and investigator who specialises in the extraordinary, to figure out what is causing the problems. That’s when they find The Forgotten Room and its contents. Without realising it, I’ve actually read one of the other Jeremy Logan mysteries. The reason I didn’t realise I had read the first in the series (this being #4) was that Jeremy wasn’t the main character in Deep Storm. 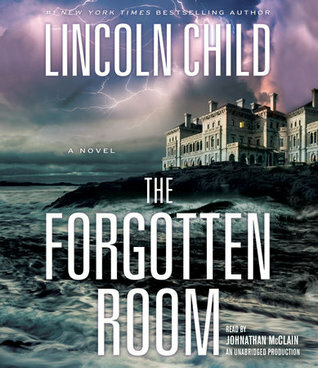 But much like Deep Storm, The Forgotten Room is a compelling mystery that hits all the right beats. Where Deep Storm was more techno/sci-fi based, The Forgotten Room has allusions to the supernatural whilst being more conventional. Where Deep Storm had a mysterious illness, The Forgotten Room has a mysterious illness. Where Deep Storm tried to kill off as many characters as possible, The Forgotten Room keeps the fatalities to a minimum. I don’t know why I’m comparing the two books in the series this much, probably because they seem to have the same general plot and feel to them. Although I do prefer the character of Logan to Crane. As with all Lincoln Child and Douglas Preston books, you can be assured of an entertaining read. Whilst Logan is no Pendergast, he does make for an interesting character to follow as he unravels the mystery. But as with my review of Deep Storm, I did feel this book to be a little too “by the numbers”. Previous Previous post: Book vs Movie: Casino Royale – What’s the Difference? Next Next post: Book vs Movie: The Princess Bride – What’s the difference?